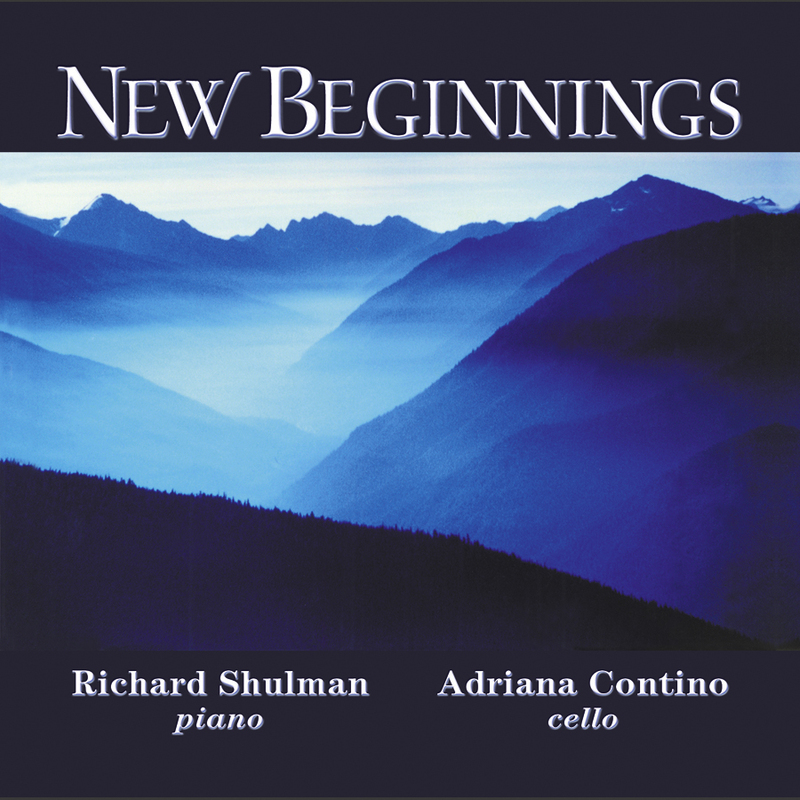 New Beginnings is a delicate balance of cello and piano, inspiration and listening, and of freely flowing improvisation with exquisitely composed melodies. I first met Adriana Contino in 1987 in New York City when I was in the process of writing a piece for cello and piano for Theatre of the Heart, a wonderful performing collective of dancers, musicians, and singers. At the time she was a freelance cellist, playing in many local orchestras. I was immediately struck by her fiery enthusiasm, which would become amplified as soon as she began to play. After we performed and recorded “First Light,” we continued to get together for musical exploration sessions. In these sessions, I learned about writing for the cello, and she was learning about improvisation. Our time together quickly ended when Adriana was hired as Principal Cellist for the Stuttgart Chamber Orchestra in Germany. Two years later, Adriana called, telling me that she had been continuing to improvise, that she was coming to visit New York for a couple days, and asked if I could set up a recording session. Excited, I wrote a new piece for us and arranged several others for cello and piano. Once she arrived, we scheduled a rehearsal and went into the studio the next day. In our two-hour session we recorded five improvisations, four of which appear here, and three of my own pieces. In the New York City style of doing our best every time, magic happened in the music as we explored the delicate balance of following the inspiration while listening to each other at the same time. And moment by moment we discovered our New Beginnings. Recorded 9/1/89 at Manhattan Recording Company, NYC, A.T. Michael MacDonald, Engineer. Mastered 4/21 & 22/03 at Soundsmiths Mastering, Stephen Smith, Engineer. © p 2003 RichHeart Music, BMI and Continuo Music. There is another recording of “Mom” with the Richard Shulman Group (Alto sax, piano, bass & drums) on the CD “Open Spaces.” There is also sheet music available on the RichHeart Music web site and by calling 888-699-3682 for “Mom” written for cello & piano, for jazz group, and an orchestral version written for jazz quartet with orchestra. There is also sheet music for a longer version of “Friendship Renewed” arranged for violin & piano, as well as a chamber group version. The lead sheet for New Beginnings is also available here.